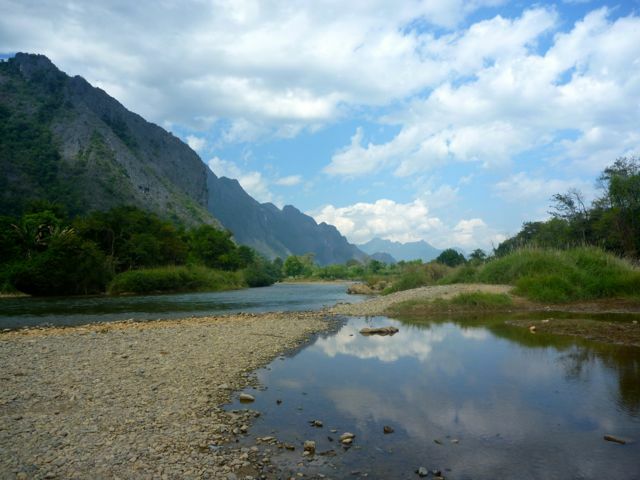 Oh Vang Vieng, you do evoke strong emotions from backpackers passing through. Usually I would say bipolar. Just looking out the window across the river and the green tall mountains (reminding me of Guilin in China) makes you understand why backpacker first made stopovers here. Then you notice all the restaurants, bars and cheap guest houses – you realize this whole town has been turned into one giant Paharganj or Pham Ngu Lao or Khao San – a backpacker ghetto. This all apparently came from tubing – sitting in large wheel tube drifting downriver until you arrive in Vang Vieng central – and it’s attraction for the Party-Backpacker crowd. Drinking, drugs and doing wild stunts in the river became the norm for tubing (also inside town) apparently and a bunch of people died each year. Vang Vieng, endless party of Laos. From what I’ve seen today, this all is very different. The authorities cracked down hard this year, closing all drinking spots on the tubing section of the river, dismantled the swings and stunt stuff and closed town all the clubs. You can’t even see a Happy Shake on a drink menu here, usually a standard in Laos backpacker stops. The town, build around party and fun, seems more like a ghost town now. A couple of small groups of Party-Backpackers looking around for something to do, a bunch of couples enjoying the endless Friends and Family Guy reruns the bars put up here. On the other hand, tubing was an almost meditative experience. Just the two of us on the river, drifting by a grand landscape, you can get a good idea why backpackers started tubing in the first place.